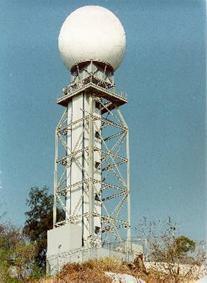 As the name suggests, the Terminal Doppler Weather Radar (TDWR) was purposely built to serve the terminal area of the airport. 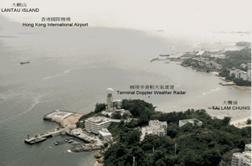 Its mission is to detect wind-shear and microburst associated with convective storms, so as to enhance the safety of aircraft landing and taking off from the Hong Kong International Airport. The radar is strategically located at Tai Lam Chung, about 12 kilometres northeast of Chek Lap Kok so that it has a clear view of the runways, airport approach and departure zones. The TDWR is specially designed to operate in a high clutter environment normally present in the vicinity of airports. It makes use of a variety of methods to minimize clutter and to eliminate the influence of such moving targets as birds, aircraft and automobiles. In this way the TDWR can accurately measure the radial wind speed and its fluctuation from which low level wind-shear can be computed. Equipped with sophisticated computer programs, the TDWR is able to automatically detect thunderstorm-induced wind-shear phenomena.